I don’t understand clematis. I can learn about its development; I can study it in books or online; I can read about other people’s experiences with clematis. But when it comes to tending real live plants, it’s an ENTIRELY different story. Clematis is definitely a “learn as you grow” plant. And every clematis, depending on where and how it’s grown, has unique personality, unique character. But apparently, clematis is incredibly resilient. Three weeks ago, I tried to be a good gardener. I came out with tools and determination to care for the clematis in the early spring like it should be cared for. It didn’t go well. I pruned a gigantic part of it down to nothingness in frustration and despair. It was overgrown, heavy, swaying, unruly. I couldn’t fix it, so I essentially started over, years and years of growth and training sheared away in minutes. I was sad. No, I was sick. I had lead in the pit of my stomach when I did it. I was sure I had irreparably harmed it forever, that it was going to die – there were only a few small shoots of new green growth left when I was done. But yet, in less than a month, the clematis regrew. In fact, it more than regrew – it THRIVED. Where I ruthlessly pruned it, the clematis has climbed as high as it’s ever been and seems set to exceed expectations for the year. Some days, I can literally see a difference in growth from morning to evening. It grows whether I train it or not, whether I prune it or not, whether I water it or not. It just. keeps. growing. But somehow, even though it baffles my very nature (hee hee – pun intended! ), this plant brings me joy. I love how forgiving it is. It DOES grow – no matter what I do to or with it. Its shoots reach out like arms and its flowers smile on me even when I don’t feel like smiling. I LOVE how my porch turns into a literal outdoor room bounded by life-affirming greenery and in time, exuberant purple flowers. I am sitting outside on the porch now as I write this, and I am so peaceful, relaxed, and calm. Clematis does that! I love how the clematis draws other life to our house. Birds nest in our clematis. And hummingbirds flit around the vines when they are in bloom – even though the blossoms are purple. I love it when people compliment my lovely porch in spring and summer, even though I know I had very little to do with how it looks. I apologize for the ugly brown, dead-looking vines when people visit in the winter. But I smile wisely inside because *I* know that the new growth comes best from the old, that appearance of death – which is simply rest and not death at all – is the price we pay for spring and summer glory. So maybe I *am* the right one to grow clematis after all. Maybe I’m supposed to learn life lessons from my clematis – patience, vision, foresight, acceptance, love. Maybe things are just as they are supposed to be. Today is Palm Sunday for Christians. I have always felt that Palm Sunday was an oxymoronic day. On one hand we remember, commemorate, and even replicate in small degree the parade that heralded Jesus’ arrival in Jerusalem for the celebration of passover. It must have been such a joyful outpouring of adoration! But minutes later, we hear for the first time this week the somber and dramatic story of Jesus’ last few days of life on earth. The same people shouting “Hosanna!” one day are yelling, “Crucify him!” practically the next. It’s a wide swing of emotions for one day, but a good precursor to the emotional roller coaster ride which is Holy Week for me. Lately, my entire life feels like an oxymoron, a carousel ride: up and down, moving, but getting no where. I feel at the same time wise and foolish; old and young; loved and invisible; supported and abandoned – some times all of those in the course of a single day! I am exhausted but cannot sleep, hungry with no appetite, desirous yet apathetic. I have been energized one moment, yet sit down and in an instant have literally no momentum. I have been full of words and thoughts…and speechless; strongly, boldly confident…and reticent; sure in my faith…and spinning in a void of questions. Since mid-December, I’ve felt like I’ve been holding on for the ride of life. I’ve felt complete awareness of this pulling back, yet a distinct disconnect from it all. Part of my brain analyzes and worries that this is not right, not good somehow while another part acknowledges that life has ups and downs, like a carousel. All my life’s a circle, and I’ve been here before; there’s nothing to be done but patiently wait it out. I’m asking some faith questions, too. Questions to which I thought I knew the answers. Questions that are a bit scary in the asking. But at the same time, I have always believed – still believe – that God is big enough for all our questions, that we were given brains to use, to apply, so as to come vigorously to our faith. And I do have faith. Deep. Forever. Unshaken. Though the details may well move around and readjust themselves for me, that truth is unmoving. I have faith that God is. I have faith that my life has purpose, that I am loved for who I am in my entirety – good, bad, and gray. And I have faith in humanity – or at least in God’s ability to turn all our mistakes into triumph. I also have faith that we’re part of a bigger picture, a larger story. I have faith that I am fully known and that I will know fully. Someday. I know I doubt, but I know. Part of my most recent blogging hiatus can be blamed on Plurk, a social microblogging site I discovered in December of 2008. Though I haven’t stayed up ’til all hours – or even all night – chatting like I did when I discovered my first online community in college in 1990, I have met many neat people from literally around the world. Two of my Plurk friends – one from Vancouver, Canada and one from York, England – are poised to meet face-to-face next week, and they are both a bit nervous about it. This post about one of my earliest face-to-face encounters with an online friend is largely for their benefit. Back in the old days of the internet (1989-1990), this whole online chatting-connecting-texting phenomenon was in its infancy. I came home from Europe, fell out of a three-year romantic relationship I’d had since high school, and found respite in a strange new digital world, albeit one basically restricted to the campus on which I was attending college. I fell in love with VMS Phone, a comparatively primitive messaging system through which you could actually talk by typing in real time to people who were simultaneously online on campus. Radical! It was neat to watch each letter appear as the other person typed (there was no “instant” in instant messaging in those days!). I spent hours glued to either my own computer or to a computer in one of the campus labs, unless it was time for class, studying, or a broomball game (my favorite sport, but that’s for another post). I even joined MCUG (Miami Computer Users Group) so I could meet face to face the people I was “meeting” online. In addition to VMS Phone, our school network had installed CoSy, a bulletin board system. With this software, anyone on campus could create a profile, basically an info page about themselves. If there was no one online with whom to chat on VMS Phone, I’d sometimes go browse the profiles on CoSy. Mostly, I just read the profiles, but every so often, I’d find someone who looked interesting and I’d email them a message. On March 27th, 1990 (or so I’m told), I sent one such message to someone who I thought, from his profile, might have gone to school with some girls who transferred into my high school. He didn’t know them, but we got to talking about lots of other things via email. Frequently. Long-windedly. Eventually, there was a MCUG meeting coming up and I invited him to come so we could meet face-to-face. He begged off, saying he had too much Calc II homework. I went anyway and did what people always did at MCUG meetings: plopped down at a computer, logged on, and chatted with people all over the room via computer. Pretty soon, I saw that HE was online. I promptly chastised him for saying he had too much work when he clearly had time to be online. He asked how I knew he WASN’T there. Well, THAT got my attention! So I ripped my eyes away from the screen and looked around the room, only to find a guilty looking, grinning guy sitting DIRECTLY BEHIND me. He had been there the whole time! Apparently, the plan was to scope me out and make sure I wasn’t hideous before he admitted to being in the room. This was easy to do, since I was one of only two women in MCUG at the time. To make a long story short(er), our 15 year wedding anniversary comes up October 22, 2009! So I don’t worry about meeting online friends face to face. It’s always turned out ok for me. Today’s post is an amazing story that shouldn’t be so amazing. I first read this story here on the Balancing Motherhood blog. The story in a nutshell: Western Oregon college senior Sara Tucholsky had never hit a home run in her 4 year softball career. Now her team was playing in the NCAA Division II tournament, the game was tied 0-0, and she was up to bat. Sara gave it her all…and slammed it over center field for a home run! 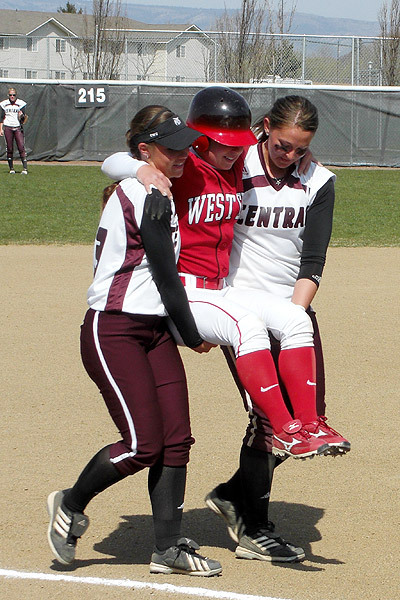 As she excitedly began rounding the bases, her right knee gave out and she crumpled to the dirt, unable to continue and obviously in a lot of pain. The referee warned the coach that her home run wouldn’t count if she were touched by anyone from her side before she tagged home base, so the coach hesitated, knowing that this was an important moment for Sara. At that moment, senior Mallory Holtman from the opposing team – her team’s career leader in home runs playing in her final home game ever – stepped up to the referee with shortstop Liz Wallace and asked if they could carry Sara around the bases. Since they were from the opposing team, their actions would ensure that Sara’s homerun would count. They carried her around the bases, slowing at each one so her left foot could tag the base, finally crossing home plate to a standing ovation. Sara’s team won the game 4-2. It probably would have gone into overtime tied if Sara’s run hadn’t counted. But no one truly lost that day. I can only imagine how proud Mallory Holtman’s parents are of her. She is one shining example of sportsmanship at its finest. Read the full story here on ESPN.